The current flow to and from the Grid is monitored by the Amp meter. If there is PV power being generated over and above what the household is consuming the excess would normally flow back onto the grid, however the Amp meter detects this and instructs the Battery inverter to charge the battery bank. Should the Amp meter detect current flowing in from the grid it will instruct the Battery Inverter to discharge the batteries. If the household load exceeds what the PV and Batteries can supply, power will be drawn off the grid in the normal manner, likewise if the batteries are fully charged excess PV will go back on to the grid. 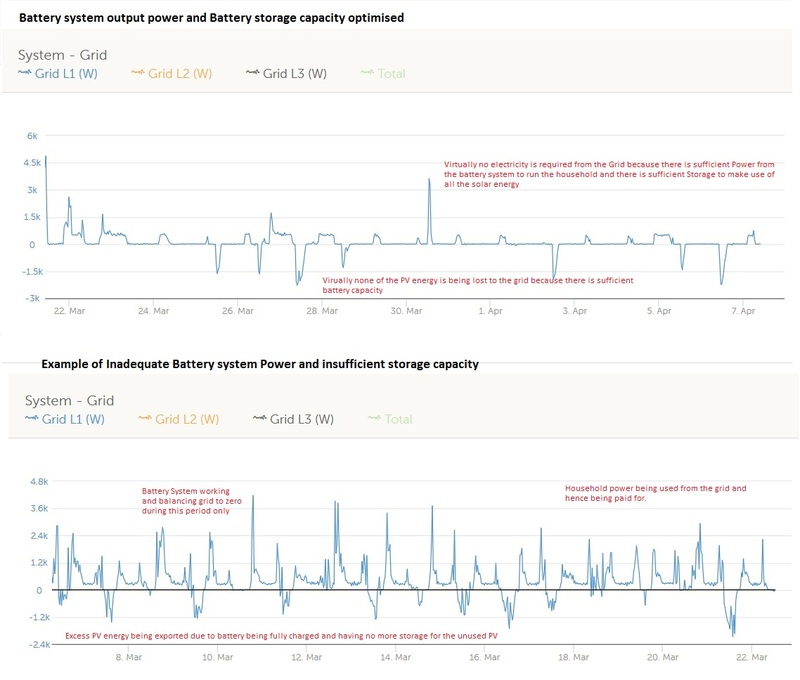 In the event of Grid failure SOME Battery Inverters will isolate the non-priority load but use the batteries to keep the priority loads (UPS) “live”, so any household load on the protected supply will continue as long as there is Battery power which also can still be topped up from the PV. This will give you an advantage of using your PV system to generate power during a power cut and also power critical loads i.e. freezer, heating controls. However a 3KWP Battery system would still be able to provide ALL the energy thus sav- ing the expense of the grid top up! The same principal applies for charging the batteries, if the household has a 3 KW PV system and a 2KW battery power package then during full sunshine the battery can only charge at the 2KW rate so potentially 1 KW of Solar Energy is lost to the grid where as the 3KW battery solution would still save ALL the PV energy for use in the household. The second critical parameter is the battery storage capacity, this is a measure of the amount of energy that can be stored in KWhours or AmpHours. This value can be diffi- cult to compare as different battery technologies and different manufacturers use differ- ent specification measurements! The charge and discharge rate , temperature and bat- tery type all affect the absolute capacity and the usable capacity is always less as fully discharging (flattening!) a battery does significant damage and the lower the discharge on each charge discharge cycle reduces the battery life. This also affects the warranty periods and the life of a battery is nominally determined as when the available capacity has reached 50% of the original usable capacity! Tesla Power Wall claim you can use 100% of their battery capacity (although what they actually do is put 7.7 KWH of lith- ium batteries in and call it 6.4KWH as lithium batteries work best with a maximum 80% discharge and Tesla sell the 100% usable capacity!) Deep discharge lead acid batteries normally recommend using a 50% discharge limit to give a long service life. We would recommend a minimum of 4KWH for a small household and 6 to 7 KWH for a larger household.